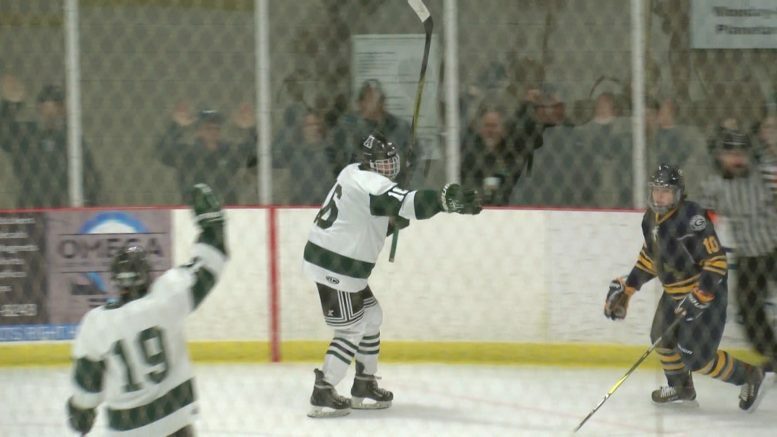 Alpena's Alex Cosbitt scores against Gaylord in revenge game. Alpena, Mich. — The Alpena Wildcats looked to get revenge from the Blue Devils after losing to Gaylord on the road, but their rematch got postponed after the compressors in Northern Lights Arena failed ending game two in the second period with 8:30 left to go and Alpena with the 3-1 lead. Kyle VanDusen had two of the three Wildcat goals. On Monday, the Blue Devils and Wildcats picked up where they left off. Late in the second, Owen Limback sent a shot deep to Alex Cosbitt. He went one-on-one versus the goalie but got stoned, then tapped home the rebound for the 4-1 lead with 0:23 left. Gaylord answered with a deep wrister from Sean Jardine off Cooper Black’s stick side with 14:09 left in the game. Less than a minute in the second, Blue Devils go with the empty netter and Alpena’s Colby Plowman gets the steal. He gets surrounded by two defenders before tossing up the puck and VanDusen snags the catch before tapping in the puck for a hat trick. Alpena skates away with a 5-2 win over Gaylord improving to 17-4-1 overall and 6-1 in the Big North Conference. The Wildcats have three games to go, including round one of playoffs against Sault Ste. Marie. The Wildcats host Cadillac and TC Central for their last two home games this season on Friday and Saturday.